You can read them for the first time or “delight in their rediscovery”, find excerpts and more at VintageBooks.com Also, if Japanese literature thrills you as much as it does me, please feel free to join the Japanese Literature Challenge 7 which runs from June, 2013 through January, 2014. The only requirement of this challenge is to read one work of Japanese literature in those seven months. I’d love to have you join in with me and twenty six others who are participating this year. Our Mailbox Monday host for July is Tasha at Book Obsessed. Previous Post Sunday Salon: What Will You Be Reading in July? Gorgeous covers. ENJOY your reads. I'm hoping to get to Japanese Literature before the end of summer, but I keep coming upon new books that I simply must read right away. I'm picking up another one at my local bookshop this afternoon. These covers show why I'm still buying actual books. Oh my word! Those are simply beautiful!! Really gorgeous covers. So artful in the groupings of four! Naida's comment is spot on! There is certainly an art of book arranging. Enjoy your books, Bellezza! They are very enticing. Beautiful! Vintage is great with their covers. I'm smitten with their Gabriel Garcia Marquez ones, as well as of Murakami's books! Wow, those look fantastic! Enjoy! Guess What? …………Yep ME Want! I've never read Japanese literature before. Like everyone else, I love the covers! Hope you enjoy them all! These look great! I'm trying to read more Japanese literature – I love the simplicity of it, and generally find it so relaxing. I am tempted to buy these, particularly as I've been wanting to read The Sound of the Mountain for so long! Lovely covers. 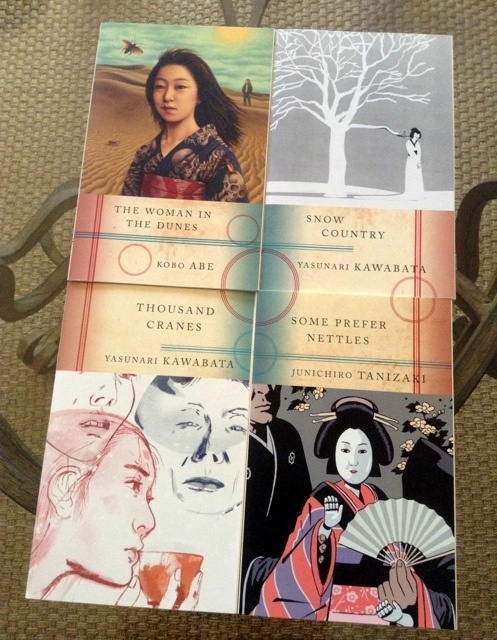 Will July have a theme for the Japanese Literature Challenge? How fun! I don't think I ever would have figured it out, or at least not with them all lined up. And actually even with them lined up it took me a while to figure it out. My favorite though it probably the third set. Wow, what gorgeous covers and excellent books! Goodness, those covers are so beautiful 🙂 How lovely to have them as a collection. Ohwowowowow! 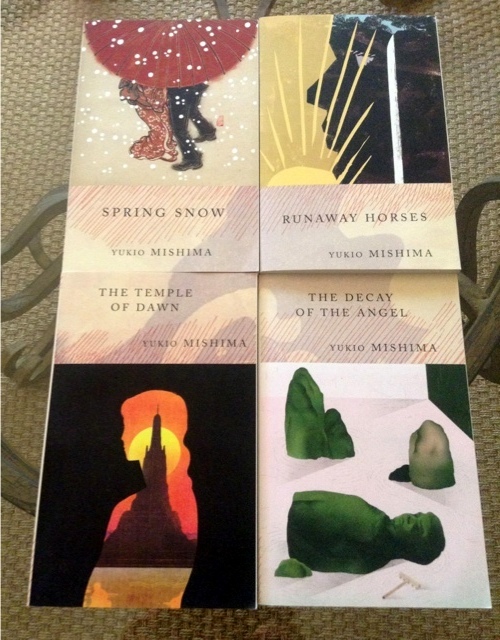 I want the Mishima tetralogy! Been coveting those books but waiting for covers that I liked! 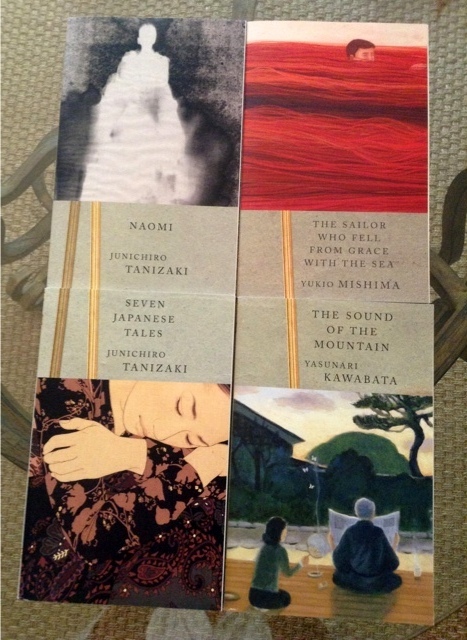 Seven Japanese Tales has a gorgeous cover. The artist looks like the one who did the painting on my header!